C. Zervos, Picasso, Paris, 1954, vol. VI (Supplment aux volumes 1 3), no. 697 (illustrated, pl. 85). P. Daix and G. Boudaille, Picasso, The Blue and Rose Periods: A Catalogue Raisonn of the Paintings, 1900-1906, Greenwich, Connecticut, 1967, p. 271, no. D.XII.19 (illustrated). P. Daix, Tout l'Oeuvre peint de Picasso, priodes bleue et rose, Paris, 1968, p. 102, no. 188 (illustrated). Bern, Muse des Beaux-Arts, Sammlung Justin K. Thannhauser, June-September 1978, p. 110, no. 31 (illustrated, p. 70). Washington, D.C., The National Gallery of Art, Picasso, The Saltimbanques, December 1980-March 1981, p. 88, no. 46b (illustrated, p. 90). Barcelona, Museu Picasso, and Bern, Kunstmuseum, Picasso, 1905-1906: From the Rose Period to the Ochres of Gsol, February-June 1992, no. 213 (illustrated in color, p. 350). Munich, Haus der Kunst, Pierrot: Melancholie und Maske, September-December 1995, no. 59 (illustrated, p. 136). Saltimbanque et jeune fille is one of a series of studies and related pictures Picasso painted while working on the monumental composition known as Les Saltimbanques or Family of Saltimbanques (Zervos, vol. I, no. 285 [titled Les Bateleurs]; coll. The National Gallery of Art, Washington, D.C.), which occupied him from late 1904 to the fall of 1905. This painting was the central and most important work of Picasso's "rose" period, and was quickly acknowledged as his first true masterpiece. Saltimbanques, also known as bateleurs or forains, were itinerant entertainers who combined acrobatics with juggling, and often performed with circus troupes, following a tradition that reached back to medieval times. Picasso, having early experienced the misery of poverty himself, long held a fascination for marginal elements in society who eked out a meager living; many such characters populate the works of his "Blue" period. 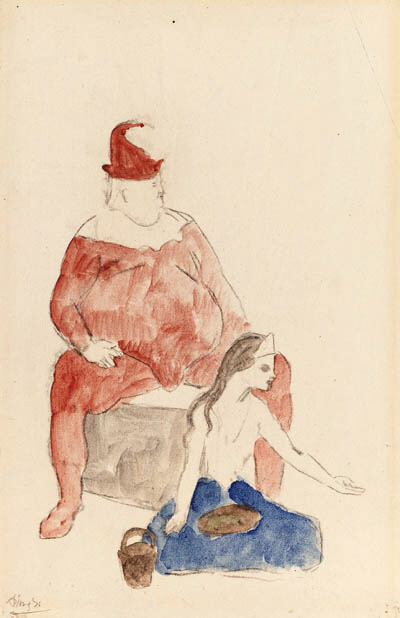 Picasso's interest in the lives of saltimbanques developed out of his friendship with poet Guillaume Apollinaire, whom the artist met in October 1904. Together with the artist's new lover Fernande Olivier, Apollinaire, the poet Max Jacob, and other painters who worked in the studios at the Bateau-Lavoir in Montmartre, Picasso frequented the nearby Cirque Mdrano. Fernande recalled that Picasso "would stay there all evening talking with the clowns. He admired them and had real sympathy for them." (quoted in T. Reff, "Harlequins , Saltimbanques, Clowns and Fools," Artforum 10, October 1971, p. 33). Indeed, it is probably no coincidence that the Cirque Mdrano performed in a pink tent, the color that came to characterize Picasso's pictures of this period. His deepening relationship with Fernande helped to dispel the darker, tragic outlook of the "blue" period, and Apollinaire wielded a powerful influence on Picasso's imagination. "Apollinaire encouraged Picasso to exorcise the last vestiges of the blues and leaven his Andalusian duende with a transfusion of Parisian vie en rose." (J. Richardson, A Life of Picasso: The Early Years, 1881-1906, New York, 1991, p. 334). Apollinaire had treated the subject of saltimbanques in his poetry, and some of the etchings which Picasso executed at that time, including the drypoint Les Saltimbanques (Bloch 7; Baer 9), may have been intended as illustrations for Apollinaire's poems. The subject of the drypoint is also seen in The Circus Family (Daix, no. XII. 18; Cone Collection, Baltimore Museum of Art), a gouache that heralds the beginning of the major Les Saltimbanques oil painting. Picasso worked for almost a year on Les Saltimbanques, twice repainting it completely, and often reworking the characters and composition. The jester in the present work later takes his place standing in the oil painting, as does the figure of the young girl. It is in fact possible to identify the people who may have inspired these figures. The red jester first appeared in a 1905 drawing as El To Pepe don Jos 40 aos (Daix, no. XII.30), a study of an actual performer. The seated child is possibly a young girl named Raymonde or Lontine, whom Picasso and Fernande adopted from a local orphanage, but soon after felt compelled to return her. Indeed, E.A. Carmean, Jr., in the catalogue for the 1980 National Gallery exhibition, has speculated that the Les Saltimbanques may refer to this sad event. The acrobat may be Max Jacob, who tried to intercede on Raymonde's behalf, and the jester may represent Apollinaire. Acting for a group of investors known as La Peau de l'Ours, Andr Level purchased Les Saltimbanques directly from the artist in 1907. When the group's collection was sold at auction in 1914 this painting was purchased by Justin K. Thannhauser, Munich, for 11,500 gold francs, a price which astonished the public and press. Thannhauser was one of the first dealers in Germany to appreciate Picasso. Indeed, together with his father, Heinrich Thannhauser, their Moderne Galerie, Munich, held the second Picasso exhibition ever given in Germany in February 1913. Apart from Les Saltimbanques Thannhauser also owned related works of this period, including the present work, as well as Seated Saltimbanque with Boy (Zervos, vol. I, no. 283; Cone Collection, Baltimore Museum of Art), in which the red jester is similarly seated, but with a young boy resting against his leg. Thannhauser also owned Zervos, vol. I, nos. 284, 286, 300 and 302 and vol. 7, no. 718. The German poet Rainer Marie Rilke, who may have known Les Saltimbanques as early as 1905, may have been instrumental in Koenig's acquisition of it. Rilke made Picasso's masterwork the subject of the fifth of his Duino Elegies, which he wrote in 1922 and dedicated to Koenig. by a never satisfied will...? (trans. S. Mitchell, Selected Poetry of Rainer Maria Rilke, New York, 1984, pp. 175 and 177).